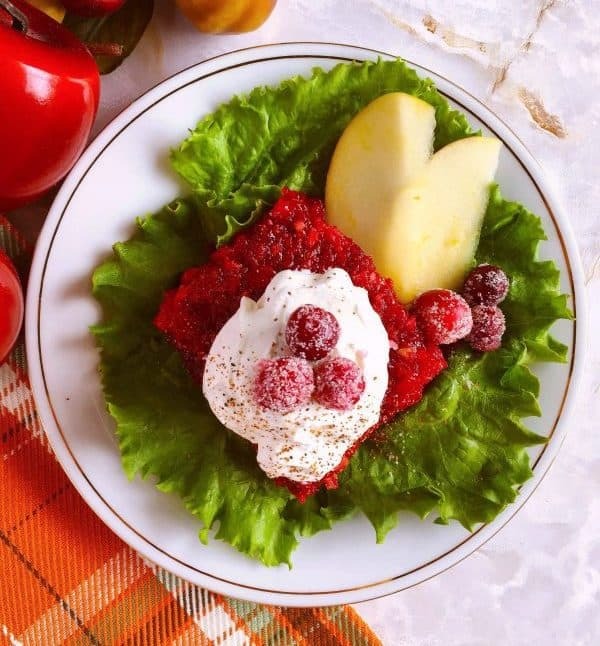 Cranberry Jello Salad is my Grandma’s recipe and it was always at all our big family Thanksgiving dinners. 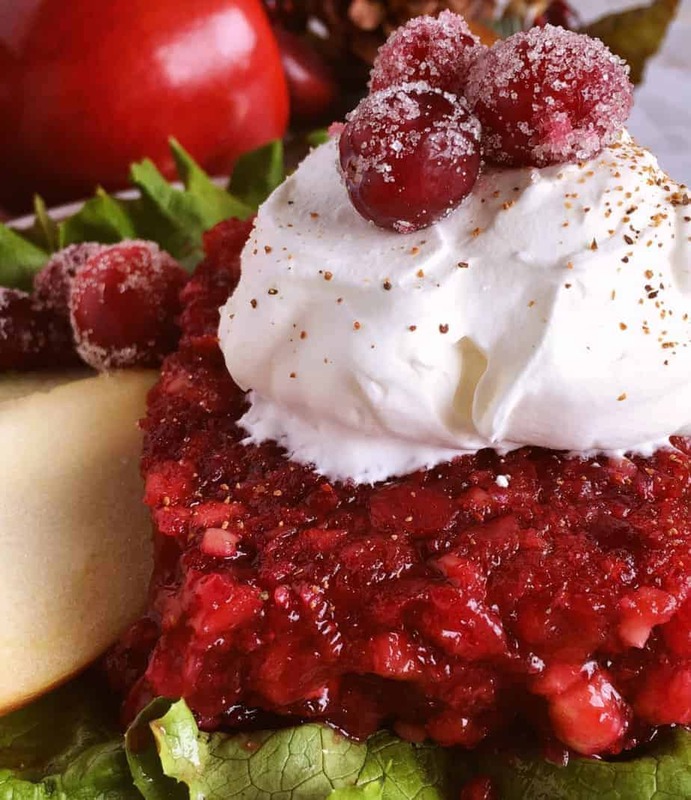 It’s loaded with fresh ground cranberries, sweet apples, and loads of chopped walnuts. I’ve topped it off with vanilla nutmeg whipped cream. Grandma made this jello salad for every Holiday Meal. It was my Dad’s favorite. Dad loved tart dishes…just like me. 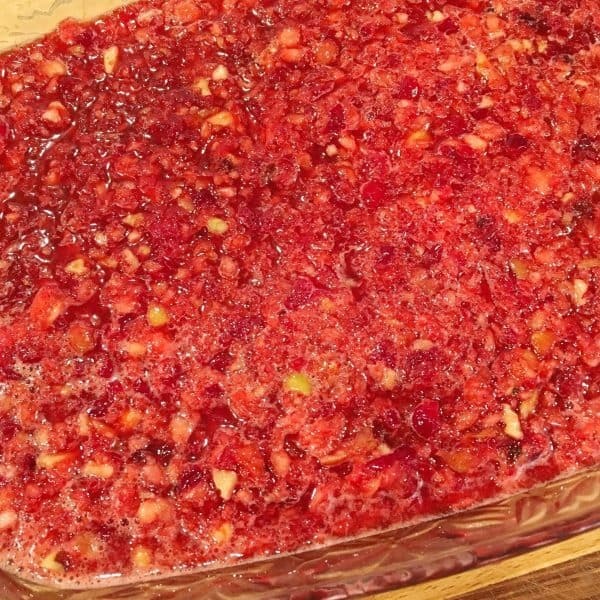 Grandma used Cherry Jello…and you can too. 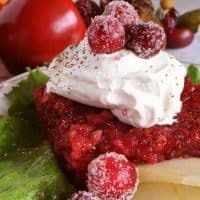 I used Cranberry and I love the difference it makes in this retro salad. I have also added a fresh vanilla whipped cream sprinkled with nutmeg. TIP: You’ll need either a food processor OR a food grinder to make this salad. Grandma used an old-fashioned hand crank food grinder. I used my KitchenAid food grinder. 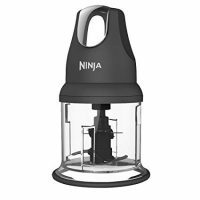 However You can use a food processor. 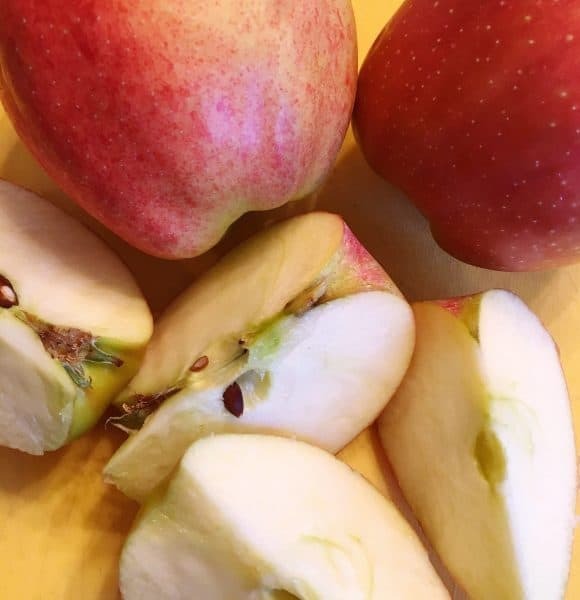 You’ll need to quarter and seed 6-7 fresh red apples. Like Gala’s or Pink Ladies. DO NOT remove skin. Remember we are grinding these up so it won’t matter. 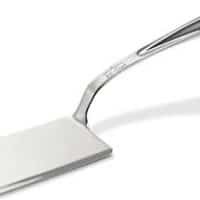 Grind them up in your food grinder or food processor. This will create a small chunky pulp. However…we are not going for baby food! So don’t over process the apples. 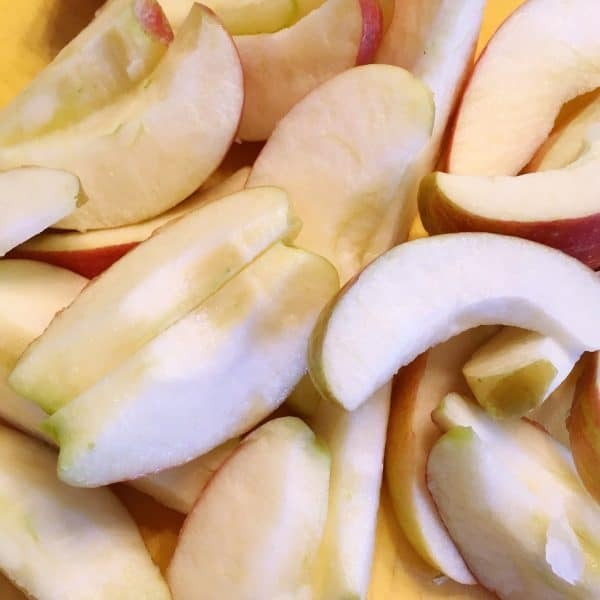 Remove the apples from the food processor if you are using a food processor. Next grind up the fresh cranberries, or place them through your food grater. Set bowl of ground apples and cranberries aside. 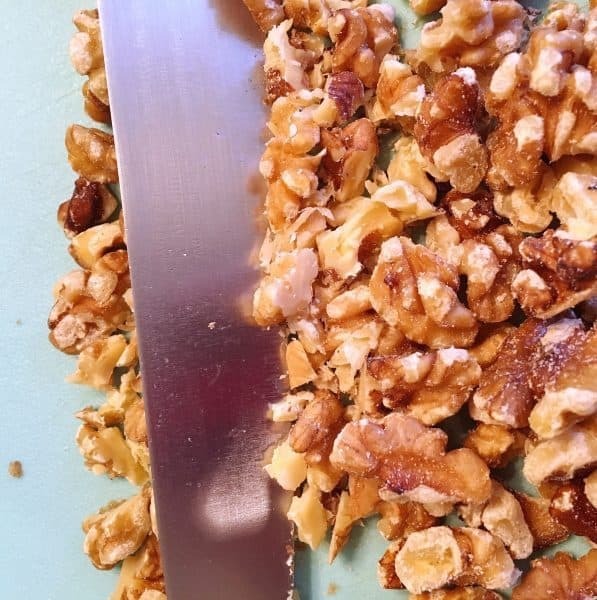 Chop 1 cup of walnuts. Add chopped nuts to the apples and cranberries. Mix together. Add 1 1/2 cups of sugar. I know…my sugar isn’t white! It’s okay. I had a huge 50 lb bag of sugar given to me and it is evaporated sugar…which means it wasn’t processed as much as pure cane sugar. Add 2 1/2 cups boiling water. Mix until sugars have dissolved. 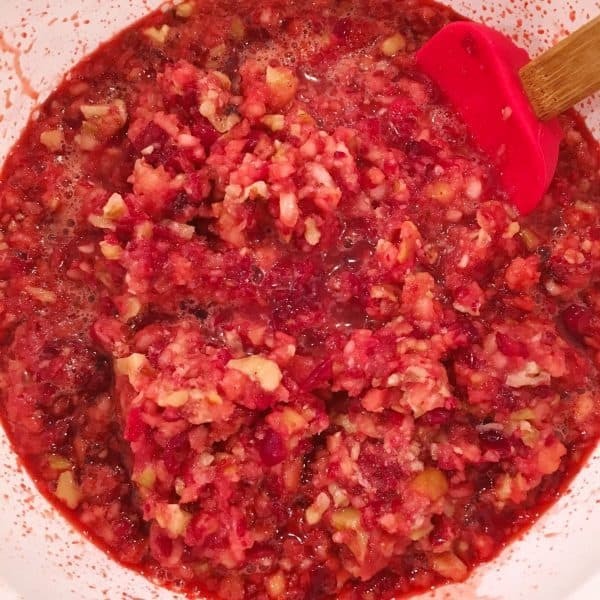 Add in Apple and Cranberry mixture. Mix well. Pour into a 9 x 13 baking dish. Chill until set…about 6-8 hours. I suggest you make this salad the day before hand! Remove from refrigerator right before serving. Cut into squares. 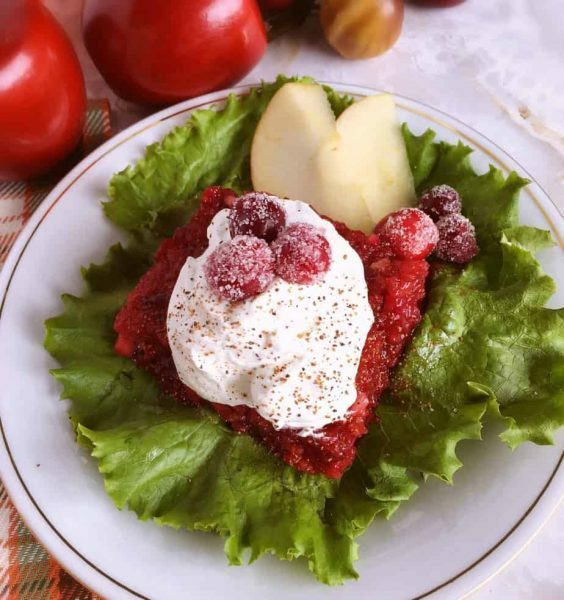 Place set jello salad square on a bed of lettuce. In the mixer add 1 cup heavy whipping cream. Add 1/4 cup powder sugar and 1 teaspoon vanilla. Whip until to firm peaks form. Place a scoop of whip cream on top of jello salad and sprinkle with nutmeg. 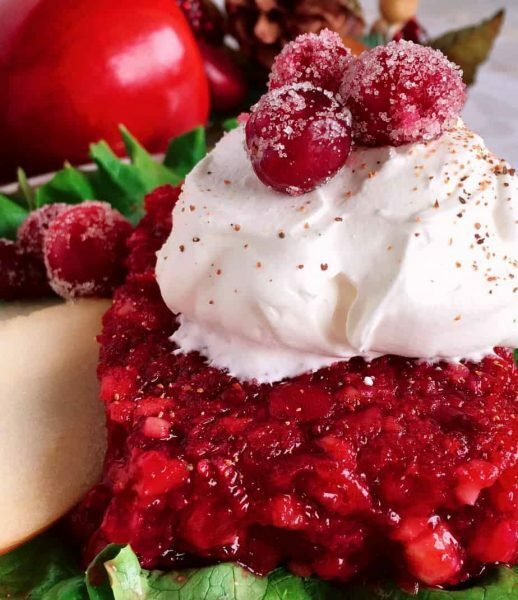 Garnish with sugared cranberries and apple wedges. It’s a beautiful salad that goes so fantastic with Turkey, Ham, or any Holiday Meal. I love the vivid stunning the colors of this salad. It’s full of fresh flavors from all the tasty fall fruit. The addition of the vanilla whipped cream adds an additional depth of flavor. I’ve loved this salad for years. If it isn’t on my holiday table at least once during the season I feel like something is missing…besides Grandma. 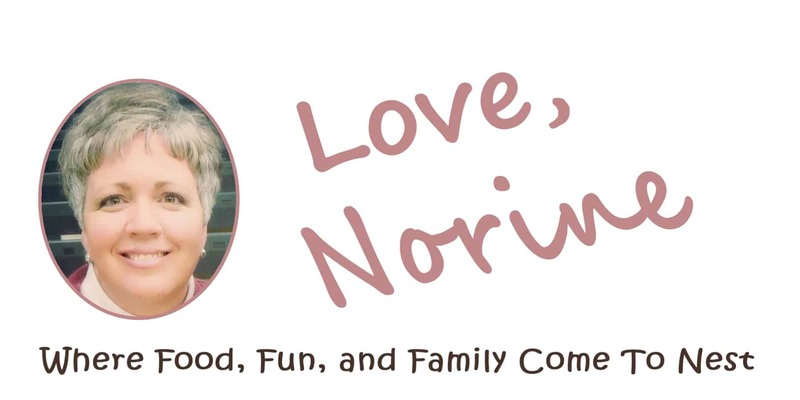 We sure do miss her, but I’m so thankful to have some of her amazing recipes to share. I’m sharing this salad over on Meal Plan Monday! Another Fantastic Link Party. Click HERE to join us every Monday. Thanks so much for stopping by. I hope you love this salad as much as everyone in my family does. You can follow me on Facebook, Instagram, Pinterest, and Twitter. Fresh Cranberries and Apples combine with walnuts to create the perfect Holiday Salad. 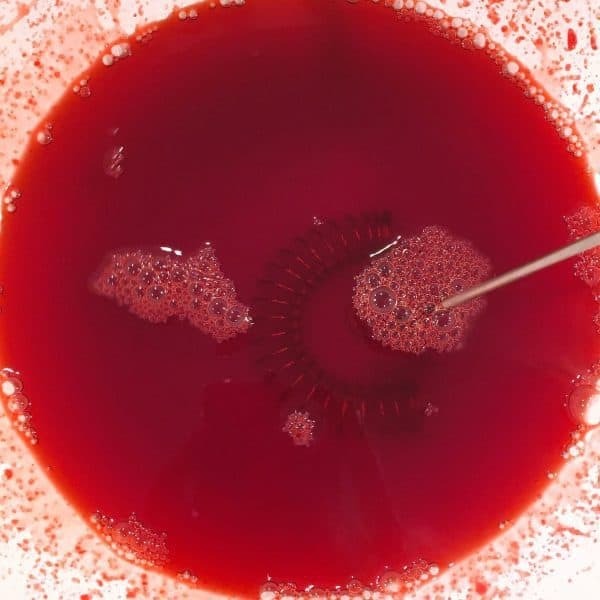 Dissolve jello and sugar in hot water. 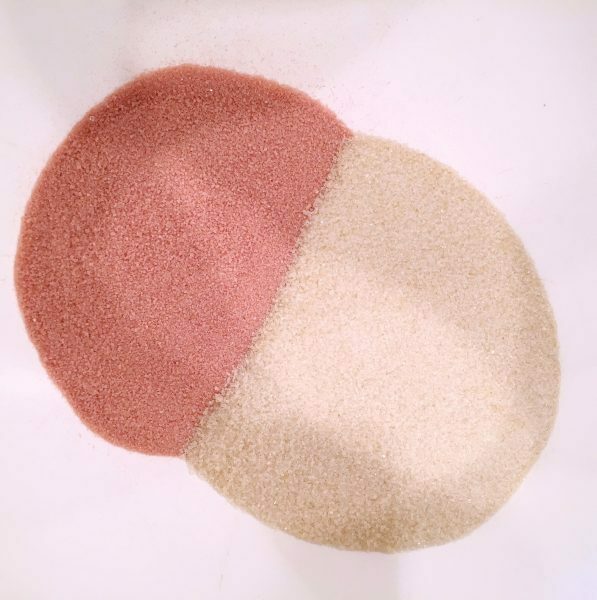 Mix until sugar is completely dissolved. 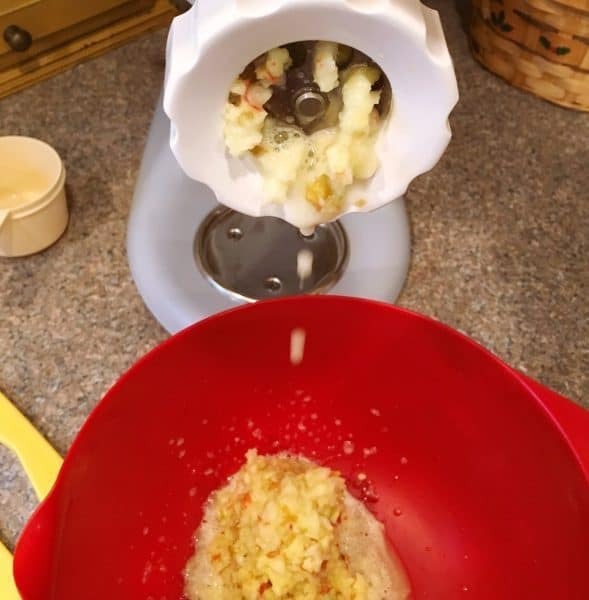 Grind Apples and Cranberries in a food grinder or food processor. Chop nuts. 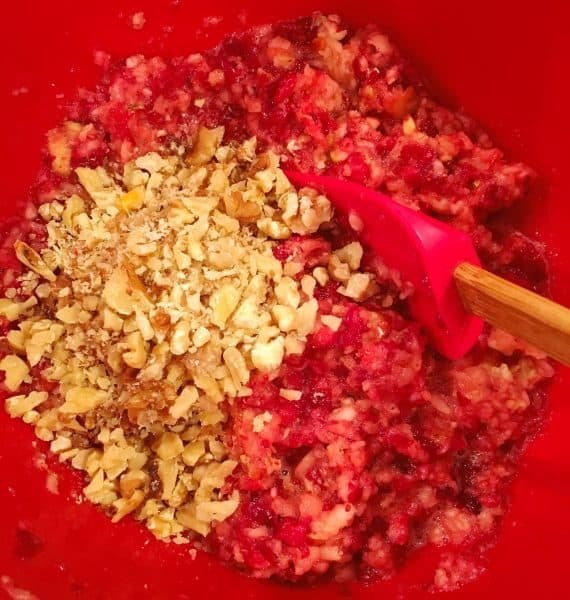 Mix nuts with apples and cranberries. Pour into a 9 x 13 baking dish. Chill until set. 6-8 hours or over night. In a small bowl pour cold whipping cream. Add 1/4 cup powder sugar and vanilla. Beat until stiff peaks form. 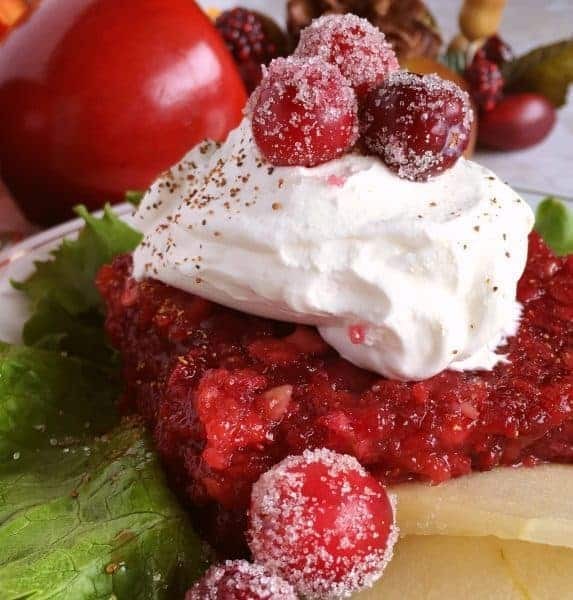 Cut cranberry salad into squares. Place on a bed of washed green lettuce. Top with a scoop of whipping cream and sprinkle with nutmeg. Cooking time includes chill time. It's best if it sets overnight. This recipe looks amazing..so pretty too. Your photography is amazing. 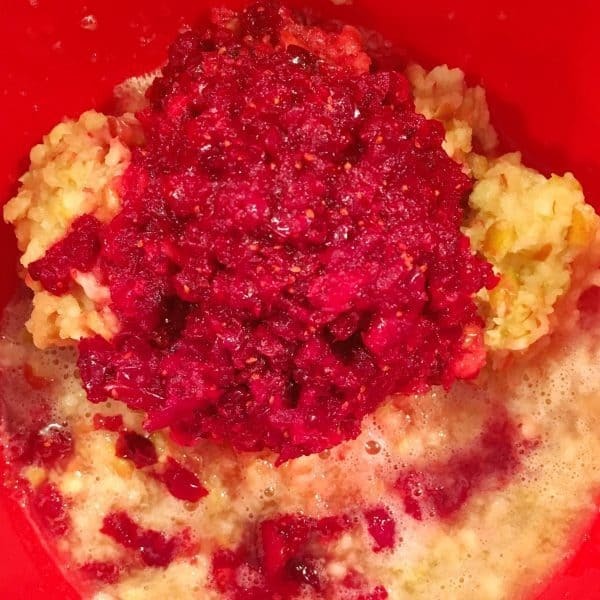 I am enjoying all of your Thanksgiving recipes & stories on Instagram. Thanks so much for stopping by and leaving a comment. I love our little group so much and it’s so sweet of you to take time out of your busy schedule to visit. You made my day! Thank you friend. This is such a beautiful salad! 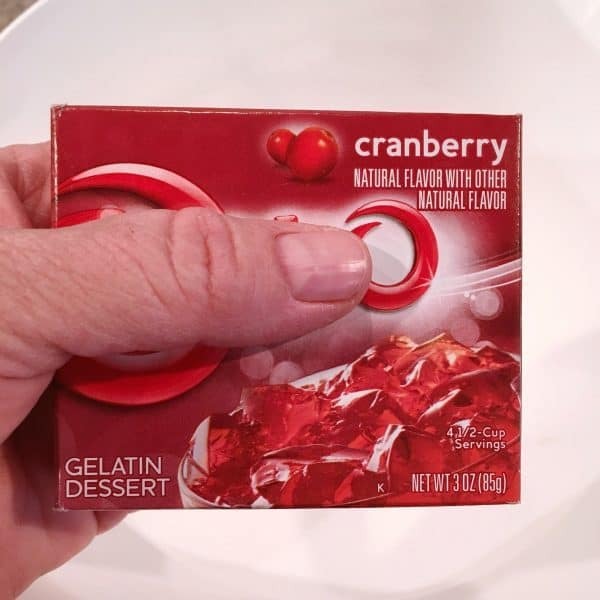 Love those frosted cranberries you garnished with too. The perfect touch for a lovely holiday dish. Thank you so much for your sweet comments. You are just the best friend! I appreciate all your love and support. Hope you had a fun vacation. That Lobster Roll though….YUM! This recipe looks very similar to a recipe I had at a friend’s house long ago. I’d really like to make it for Thanksgiving, but I was wondering if you could tell me how big or how many ounces your package of cranberries was. My local store sells them in packages from 8 oz. to 12 oz. to 32 oz. and I want to get the right amount. I’m so sorry. I should have been specific with my instructions. It’s 4 cups of fresh cranberries for a 9 x 13 pan of Jello Salad. I’m guessing the 12 oz. package? I always buy the really big bags at Costco so I just measure it out. I went and updated the recipe card. Again I’m sorry I wasn’t more clear on the instructions. I hope you’ll love this salad as much as we do. 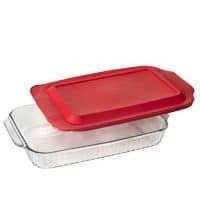 My husband isn’t a big jello salad fan and even he loves this one. I have NO doubt I could eat all this by myself! Oh how I adore cranberry salad. And with those chunks of apples/cranberries/walnuts…I can only imagine how fabulous this is. Your photos are awesome too. SO glad you shared. Pinning for now til I can make it for myself…. Thanks so much sweet friend. 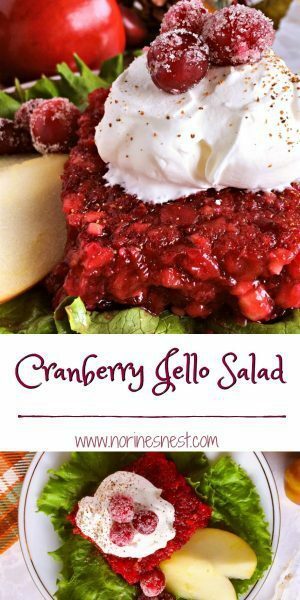 I love cranberries too and this salad hits the spots. Thank you for pinning and sharing. I sincerely appreciate that. I hope you have a great week! This jello looks fabulous! Thank you for sharing. Shared and pinned. Thanks so much for the compliment and for sharing! I really appreciate it. I love this Jello Salad! It reminds me of my grandma and happy family times. I love this salad and it is a family favorite. I add a whole orange , ground, with peel with it. 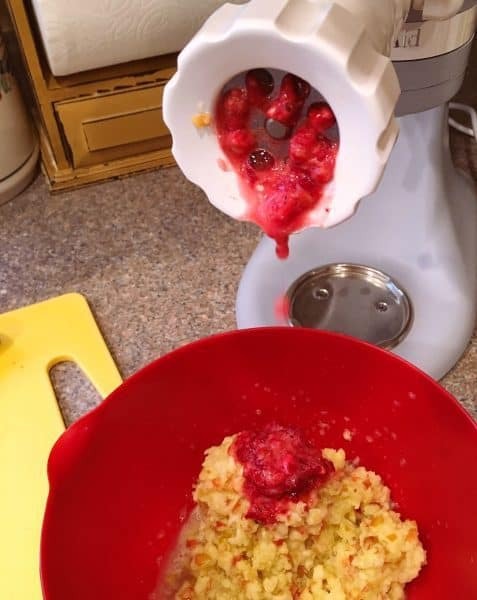 A tip to make grinding less messy with squirting juice is to freeze your cranberries. Just toss the bag and all in the freezer a few hours or overnight.